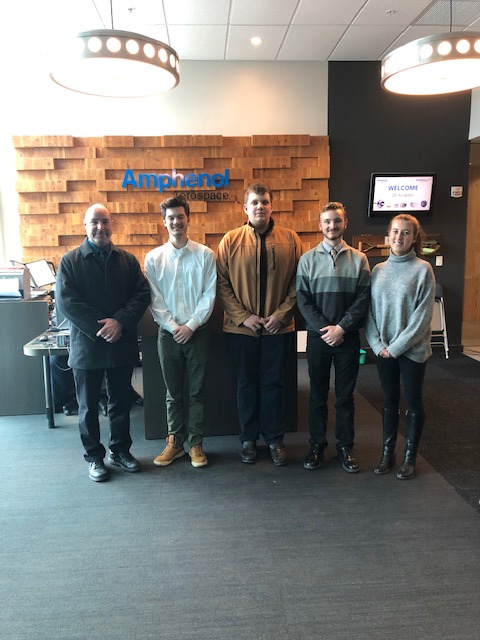 On Tuesday, March 12, the New Visions Engineering Class of 2019 had the privilege of touring Amphenol Aerospace Operation’s 307,000 square foot industrial facility located in Sidney, New York. The visit began with Neal Wobbe of the Human Resources department giving the class a brief presentation that explained what goes on at the Amphenol factory and the types of engineers that work there every day. After the presentation, David Brockway led the students to the main factory floor, where Amphenol produces cable connectors for a variety of customers, including the United States military and the International Space Station. Not only was the class taught about the many complex machines required for connector production, but they also learned what a successful, modern factory and business look like. In Amphenol’s factory, it is common to see machines and humans working together to achieve a common goal, which is an indication of the company’s commitment to technology and efficiency. Amphenol also put an emphasis on their strategy of repurposing human jobs to oversee and supervise tasks done by machines, rather than replacing factory jobs with robots. Following the tour, the students were given more information about what to expect in college, especially regarding the internship and co-op opportunities available at Amphenol Aerospace. The tour and presentations will help give the New Visions students an advantage when they are looking for the right internships and job offers in the future.